For the past year, Kraxberger Middle School has been preparing to celebrate its 50th year serving students in 2019. School leaders are enacting a series of Kraxberger Rising initiatives as an opportunity to transform the school in ways that maximize student potential. "Many of us remember our own middle school years as a rough patch, an awkward time of transition," said Principal Len Reed. "Today's middle school must be so much more: a collaborative learning space where students grow academically, socially and emotionally in a supportive community." The school's Parent & Family Organization gives parents ways to connect with school leaders, support students and get involved as volunteers. A new Parent Welcome Center provides coffee, social service resources and a place to swap parenting strategies during the turbulent years of early adolescence. "We are actively inviting parents to stay involved in our school," Reed said. 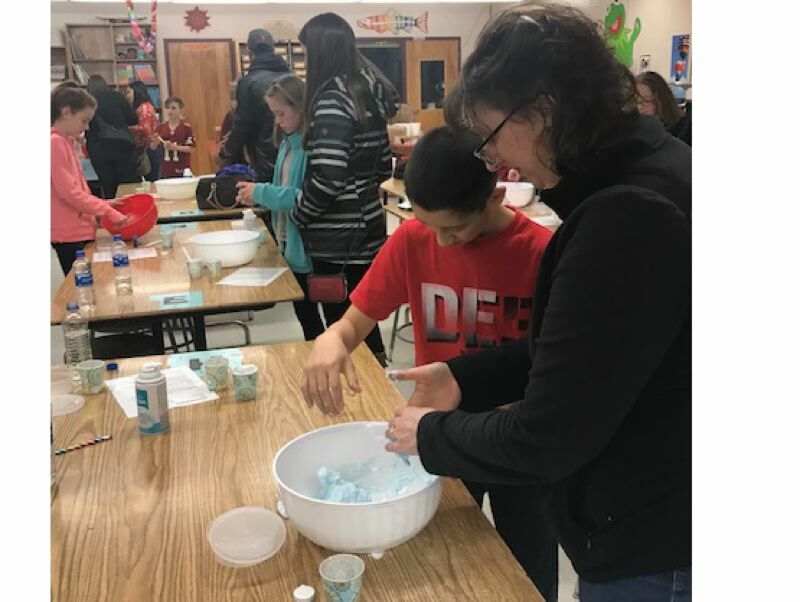 "Whether they join us for Science Night or lead an after school club, this provides opportunities to engage with kids in fun ways that support learning." Kraxberger's Student Leadership last year helped dedicate a Peace Pole in the school courtyard and created a kindness tree, where students could leave paper hearts thanking others for acts of kindness. "We find that young teens are often influenced by their peers, so when students speak up about values like inclusiveness and kindness, kids listen better," said Jeff Waters, assistant principal. "Students learn that they are stakeholders and giving them the opportunity to advocate for change in their school — including policies — is also part of the learning process." A $12,000 donation from the Gladstone Education Foundation is transforming the main gym into a Celebration Hall for assemblies that recognize academic achievement, good attendance and student accomplishments in community service, kindness and perseverance. "We're creating a magical space with colorful, inspirational banners and upbeat music that energize students and bring us together as a community," Reed said. "I want every student to realize their own potential and our collective power to make Kraxberger a school to watch." The annual conference of the Oregon Association for Talented and Gifted will take place Saturday, Oct. 20, at Clackamas Community College, 19600 Molalla Ave., Oregon City. The conference theme is "Bridging Gaps" and the keynote speaker will be Jonathan Plucker, president of the National Association for Gifted Children and professor of talent development at Johns Hopkins University. An expert on creativity in gifted children, on achievement of high-performing students, and on successful methods for increasing equity, Plucker has published more than 200 books, chapters, articles and reports. Clackamas Community College's next job fair is a free, public event from 10 a.m. to 1 p.m. Tuesday, Oct. 9, at the Gregory Forum, 19600 Molalla Ave., Oregon City. There will be a veterans networking pre-event from 9 to 10 a.m. for veterans to have the first priority to meet with employers. "This event is an all-industry job fair where local employers with full-time and part-time employment as well as internship opportunities connect with CCC students, alumni and local job seekers," said Kyle Thomas, student support and career coordinator. Start the fall gardening season off with a workshop from the Clackamas Community College Horticulture Department. Learn how to grow food year-round in a mini hoop house. Participants are encouraged to bring up to a dozen, 10 feet by half-inch galvanized electrical conduit. Cost: $20. Learn the laws and regulations related to application, handling and storage of pesticides. Participants will learn techniques for product selection, applicator safety and environmental protection. This workshop can be used as preparation for the Oregon Pesticide Laws and Safety exam. Cost: $178. This workshop fulfills the Oregon Department of Agriculture's (ODA) yearly continuing education requirements to renew pesticide apprentice applicator licenses. Esta clase se enseña en español también. Cost: $80. This workshop qualifies participants for four CORE credits as required by the ODA. Cost: $40. Learn how to make herb gifts and holiday arrangements including which herbs and plants are appropriate for use. Cost: $45.